The Sherwood High School girls golf team looks to be ready to go in its debut season in the Pacific Conference this season. With some key returnees, and strong newcomers, the Lady Bowmen have high hopes as they begin play in the new conference. "We are excited to get a great start this year," first-year Sherwood coach Shelby Hunt said. "With this year being our first in the Pacific Conference, our team is ready to head to the top. We have several returning girls as well as first year players looking to make an impact on our program and make their presence known. Many of the girls have continued to work in the offseason to strengthen their skills, improving in all aspects of their game to fight for their varsity spot." Junior Ally Plusquellec is one of the key returnees for the Sherwood squad. Plusquellec has qualified to play in the Class 6A state tournament as an individual each of the past two years. Last year, she finished in 34th place at the state tourney held at Trysting Tree Golf Club in Corvallis. "Ally Plusquellec will continue to shine as her passion for the game runs deep," Hunt said. "She is constantly working on her skills preparing for a rewarding season." The Lady Bowmen also return a pair of seniors in Avery Gladheim and Chloe Knudson. "They are ready to make an appearance at the top of the league for their final year," Hunt said. "These two girls are motivated leaders, ready to help push the team to a new level of competition." Among the key newcomers to the team is freshman Audrey Bonn. "She is off to a hot start, securing her varsity position for the season," Hunt said. And, the Lady Bowmen, as a team, have big goals for the season. "We have a group of motivated, hard-working, and passionate girls ready to make their way to the state tournament," Hunt said. 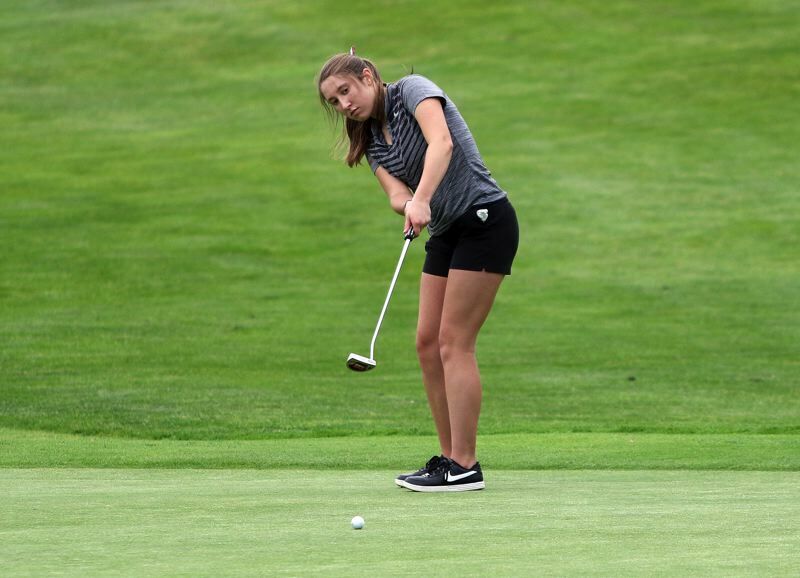 The Sherwood girls got their conference season off to a strong start, taking first place at the opening Pacific Conference tournament of the season, held March 19 at the Reserve Vineyards and Golf Club. The Lady Bowmen took the top spot at that event with a team score of 374 strokes, easily putting them ahead of second-place Forest Grove, which had a score of 442. Bonn led the way for Sherwood at that tournament with a round of 90, putting her in second place in the individual standings, behind only Century's Mariah Maurer, who shot an 85. Knudson was third overall with a score of 91. Plusquellec was fourth with a round of 94 and Gladheim was sixth with a score of 99. Also for the Lady Bowmen, Tatum Allen shot a 122. The Sherwood team will next be in action on Tuesday, when it plays at a Pacific Conference tournament to be held at Michelbook Country Club in McMinnville.